Mysterious pictograms consisting of several circles have appeared on a wheat field in Southern Russia's Krasnodar region. Was it someone's joke or did aliens visit us? According to enthusiasts from Kosmopoisk (Space Search group), it's not the first time such a phenomenon has been discovered. Group members have visited the spot to carry out research and film the area from an unmanned helicopter. The circles appeared in the Dinsky district in the region. "The figure consists of eight circles and rings around them that are interconnected," the group coordinator, Vadim Chernobrov, told Interfax news agency. "Their sizes vary from 5 to 25 meters." He said they had known in advance of an approximate date when signs would appear. The Kosmopoisk website reports that according to area residents, the night the circles appeared shining balls were seen in the sky. The experts now seek to determine whether the marks in the fields are man-made or whether their origin can be explained by someone's joke. The activist from the group set up special "watching points" to spot the appearance of the pictograms in the areas where they might appear, judging by past experience. They choose the highest places in the area. According to Chernobrov, each time it happens the same way. At about 1.15 AM some animals start to show anxiety, especially cows and dogs. But in exactly five minutes they all calm down and complete silence falls within a radius of 20-30 kilometers from the place where the circle will later appear, and no sounds of frogs or insects can be heard. Then the observers notice a shining light in the field, it can last from a few minutes to several hours. Sometimes people begin to panic by this time and feel a desire to leave the zone. Also, from time to time cars won't start and mobile phones and cameras may be down. The mysterious phenomenon hit several areas in the region. Pictograms appeared not only in Dinsky district, but also on one of the fields near the town of Armavir. But the UFO-logists had no opportunity to study them: the farmer who spotted the circles was scared that the mysterious things will make superstitious customers refuse to buy his wheat, so he leveled the pictograms with a tractor. Just like in the movies, most Ufologists would love to get in touch with the extraterrestrials. Chernobrov, who has spent more than a decade exploring the unknown, says this may happen someday, but for now even observing the crop circles could lead to a breakthrough if we break their secret code. "You cannot forge these figures easily, like in Photoshop. It's a complex matter of non-human origin. According to many we are already being contacted, and crop circles are like text messages that we have to decode," Chernobrov says. Groups of enthusiasts investigate the pictograms in the fields and work in 35 countries throughout the world. Similar phenomena have been reported in the UK, the US, Canada, Denmark, Spain, and Germany. Some researchers say that the geography of the circles is not chaotic, claiming that if one draws the lines on the map, connecting the places in Europe where they appear, he will draw several parallel arcs. Just as crop formations are appearing in vast numbers in England near ancient megalithic stone structures like Stonehenge, these new crop circle formations in Russia's Krasnodar region are appearing near an area known for ancient megalithic dolmens. 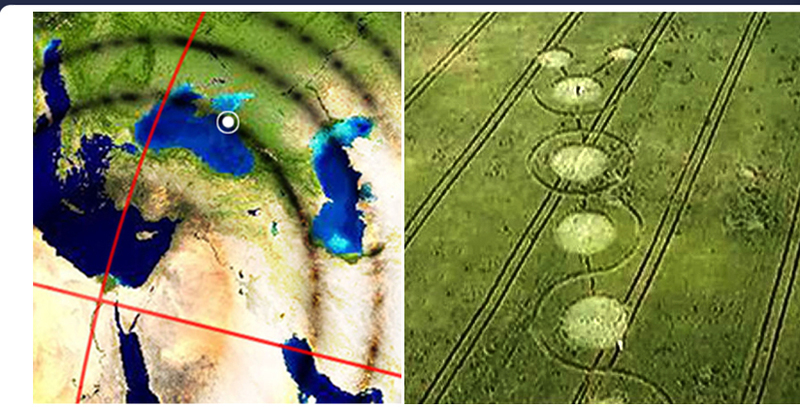 While the Great Pyramid of Giza sits on the 30th lattitude, these two crop circles are located on the 45th latitude. The Dinskaya crop formation (45.17°N 39.19°E) is 1,137 miles from Giza, or 4.56% or the Earth's mean circumference. The earlier crop formation nearby in Armavir, Russia (45.00°N 41.00°E) was 1,168 miles from Giza, or 4.69%. This resonant circle formed by infrasound standing waves at 4.5% distance from Giza is but one of the "parallel arcs" that researchers like Chernobrov are becoming aware of as the phenomenon of crop circles spreads around the globe. 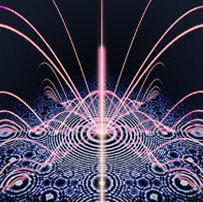 The resonance mapping presented throughout this site, provide a complete theory of magnetic resonance that underlies the precise geometric configuration. The Krasnodar region's dense clustering of hundreds of megalithic dolmen shows all of the hallmarks of the Sanskrit kundalini sacred technology found throughout the world, often in gigantic dimensions. Psychoacoustic symbols are serially repeated throughout these dolmen: zigzag waveforms in carved relief and the pure geometry of the circlar portals and squared rooms. The proportions of the chambers have also been shown to have been calibrated specifically to the human vocal range, being commonly 12' x 12' or 12' x 15'. The piezoelectric calcite and quartz content of the stones are used to resonate the calcite biomineralizations of the pineal gland, inducing a hemispheric synchronization in the brain. The same effect is observed inside genuine crop circle formations as well. These dolmen bear striking similarities with the Sanskrit megalithic temples of Malta. As shown on the resonance map above, the Zhane Valley and Malta sites are both located exactly the same distance as the srop circles are from Giza's Orion pyramids: 1,120 miles away or 4.5% of the Earth's circumference. This complete set of synchonous features reveals that the piezoelectric temples were designed to transduce the sacred infrasound pulsation focused by the Orion pyramids.